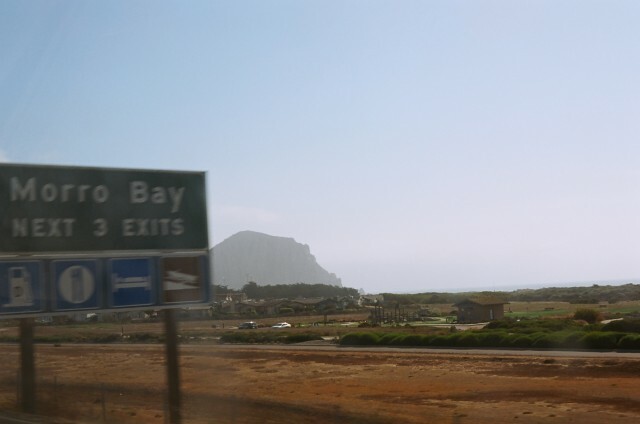 For an anniversary trip, my husband and I drove up to California’s Central Coast to a small town called Morro Bay. We had been there once before in 2006 and knew we had to go back. Of course, as soon as I booked the trip I had to research some restaurants. 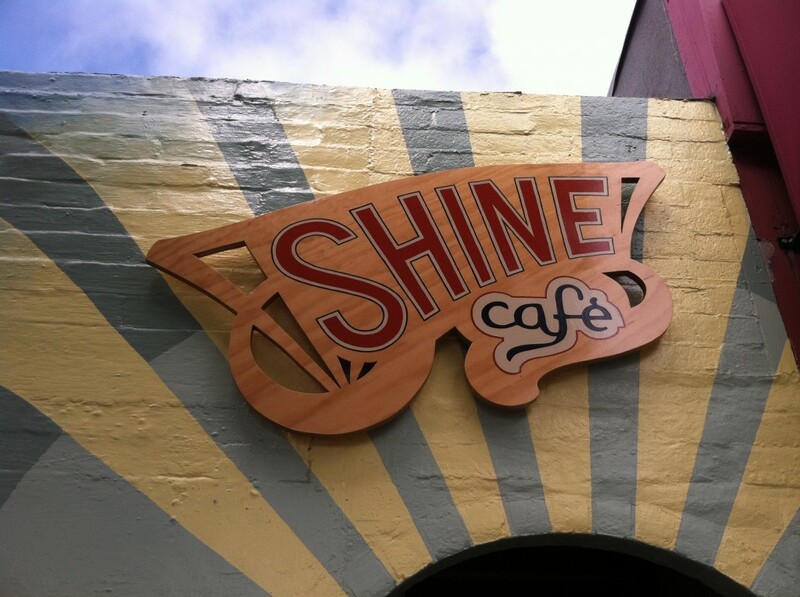 Shine Café– This was our first stop in town and our last. That’s because we fell in LOVE with Shine Café. 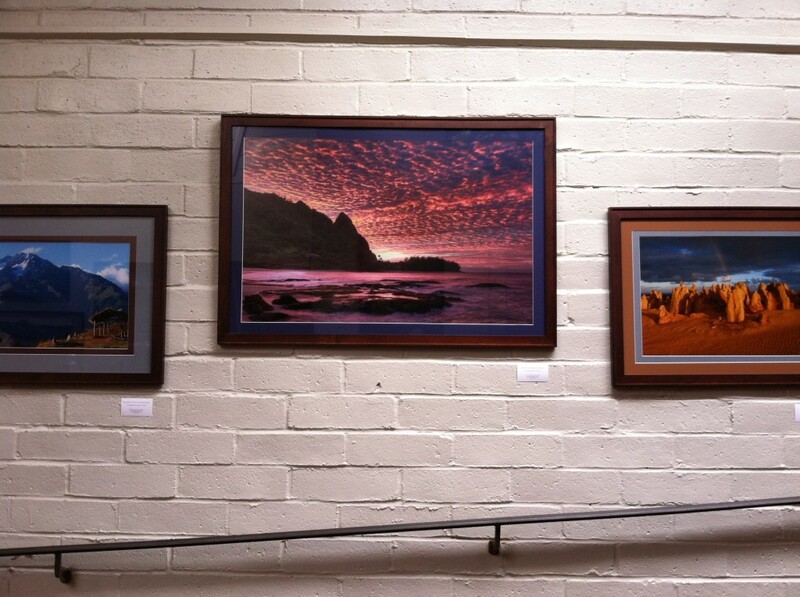 Right as you walk in, you can feel the warmth and positivity. There are beautiful photos hanging on the walls, smiling people dining and serving you and tons of natural light coming in through the skylights. Vegetable Spring Rolls– These were absolutely delicious! I’ve NEVER tasted temeph like this in my life and I have to find out how they make it. I’ve only had tempeh in strips or pieces but this was completely different. They used a large scoop of mashed, seasoned temeph that was incredibly moist. 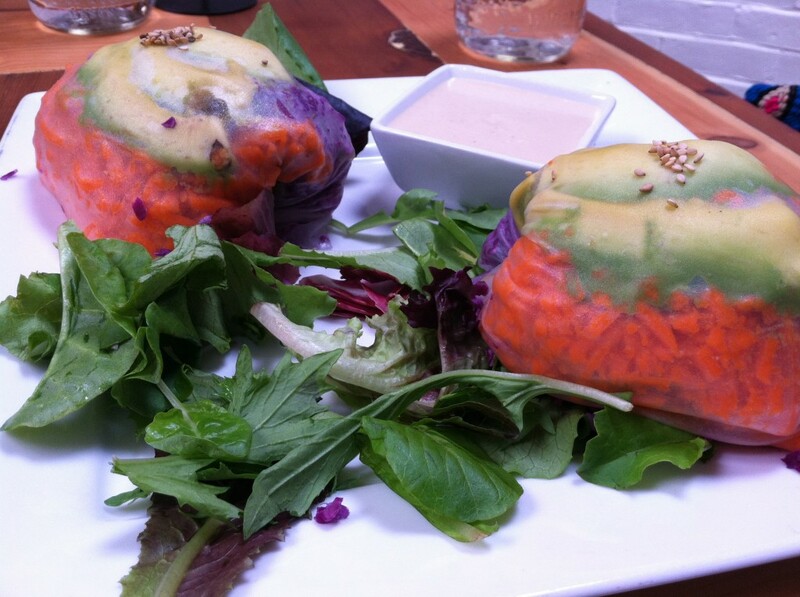 Inside the rice paper along with the temeph was avocado, carrots, purple cabbage served with a side of sesame ginger dipping sauce. I could eat this daily. Shine Hummus Wrap– I’ve had many hummus wraps in my day and I make good ones at home, but this one was so full of flavor and I couldn’t get enough. The wrap was stuffed with a homemade curry hummus in a wheat tortilla with arugula, avocado, kalamata olives and fresh veggies. 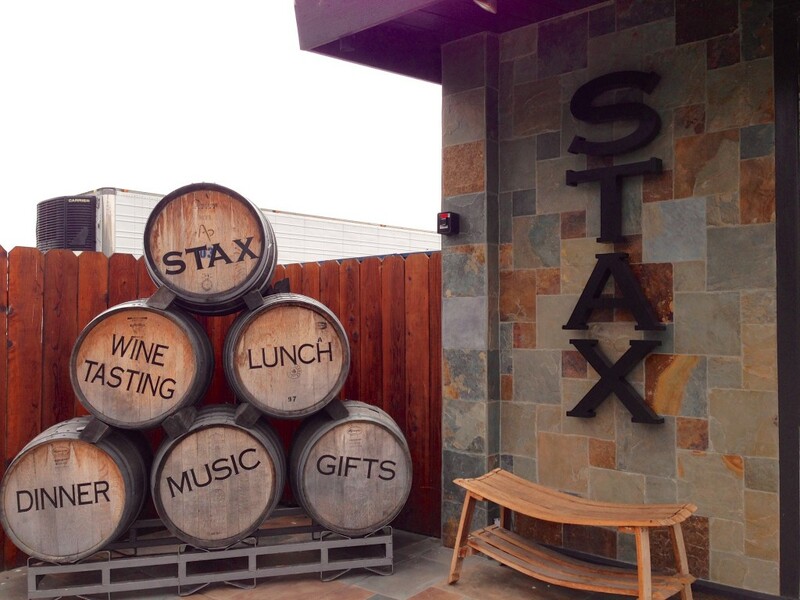 After a day of wine tasting in Cayucos, we headed back to Morro Bay and ate at this wine bar named Stax. This place had a hip, modern vibe but was cozy at the same time. They have a great wine selection and as far as food goes, this is what I loved. 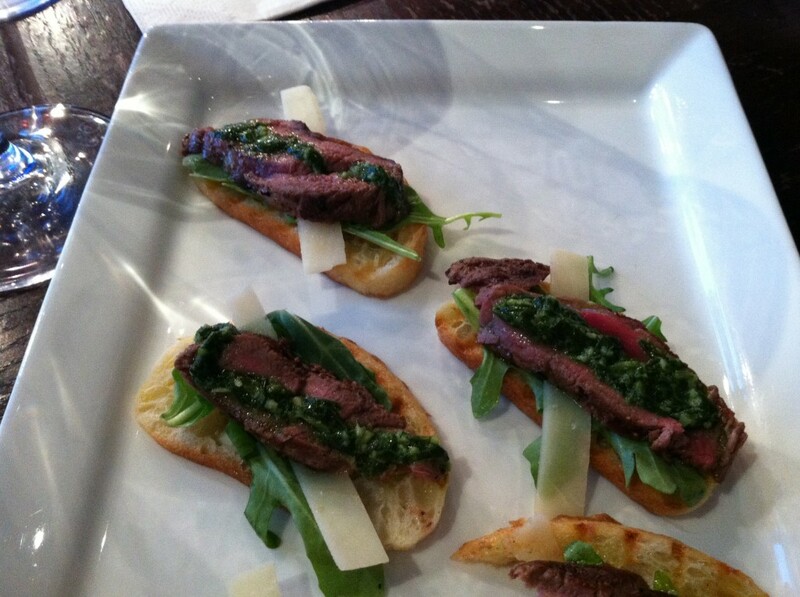 Crostini ala Filet Mignon- I would have been content only eating this the entire night. The filet was grilled to perfection with a black truffle seasoning and topped with a basil aioli. The crostini was fresh and between the baby arugula and shaved parmigiano-reggiano- you just can’t go wrong here. 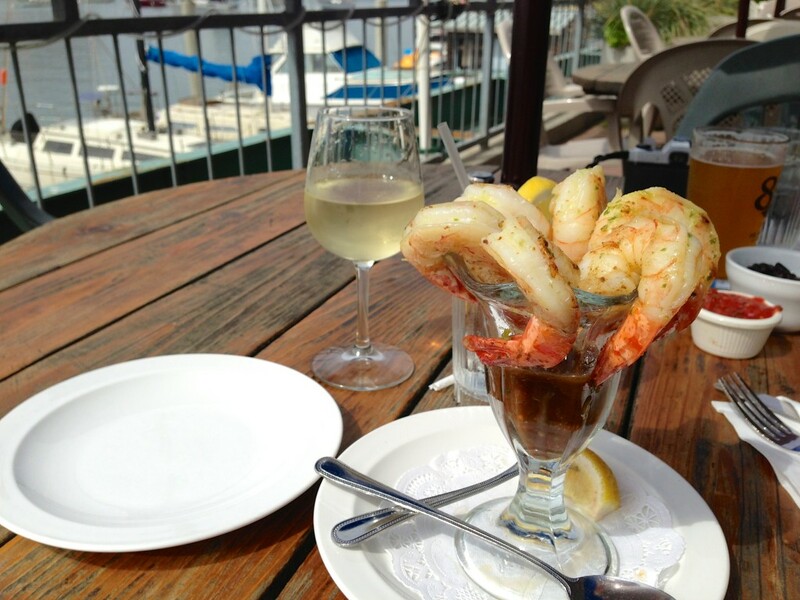 For lunch one day, we stopped at Blue Skye Coastal Cafe and had seafood and wine right on the bay. It was breathtaking and so peaceful. My prawns were fresh, plump and feisty with the chipotle seasoning adding a nice kick. 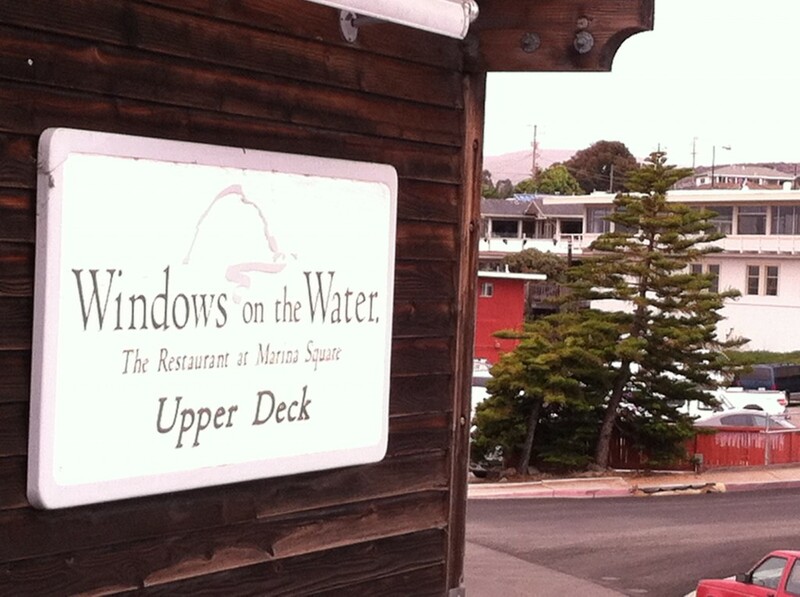 For our anniversary dinner, we decided to go to Windows on the Water. We were so delightfully pleased by this place. It had great reviews, but you just never know. Our waiter was an absolute doll. He let us try a few different wines before we decided on a bottle, and he even brought me a complimentary taste of the Bouillon Style Clam Chowder they are known for. It was the best clam chowder I’ve ever had. It wasn’t thick and creamy like the classic style. It was brothy, light and full of flavor. Not everybody’s cup of tea, but it was definitely mine (sorry no photo). We had a wonderful window table with a view of the bay and to our surprise, there was an incredible musician playing live music. His name was Jodi and we found out he was on NBC’s The Voice and made it pretty far. He honestly made our evening. His voice was beautiful and the music just added to the romantic ambiance we were craving. Goat Cheese Bruschetta: We started with this scrumptious-ness. 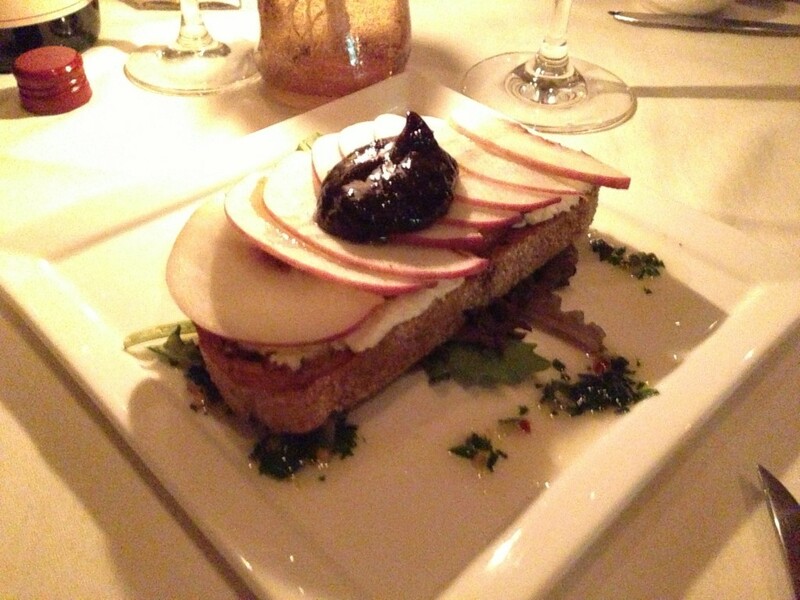 Between the fig jam, the pears, the bacon and the goat cheese we were beyond satisfied. This was my husband’s favorite. 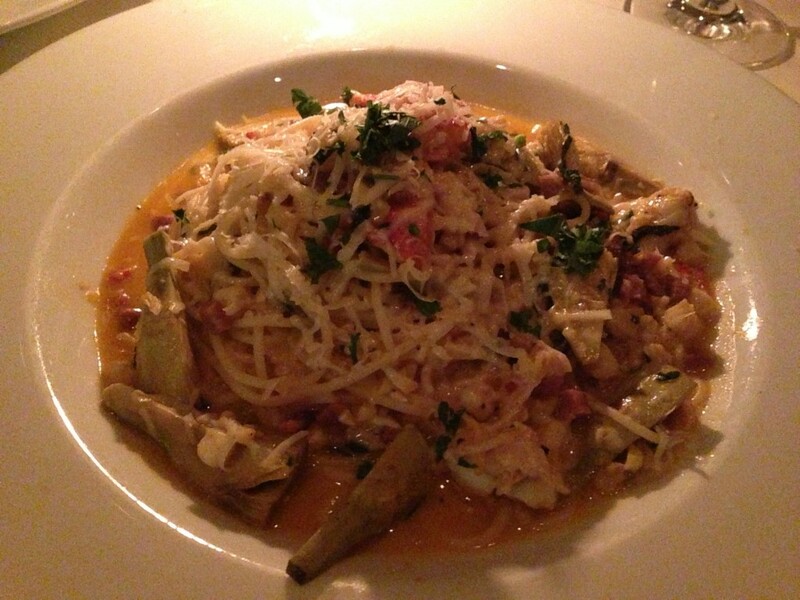 Lobster Pasta– I forget exactly what this was called on the menu, but it had artichokes, tomatoes, lobster, fresh herbs all in a white wine sauce. Morro Bay Black Cod: This dish won Sunset Magazine’s “Battle of the Bay” competition. It was so unique with avocado, tomato salsa, prosciutto caponata and spinach. It was very well balanced and tasty! Another reason this restaurant has a special place in my heart, is because it’s environmentally friendly. 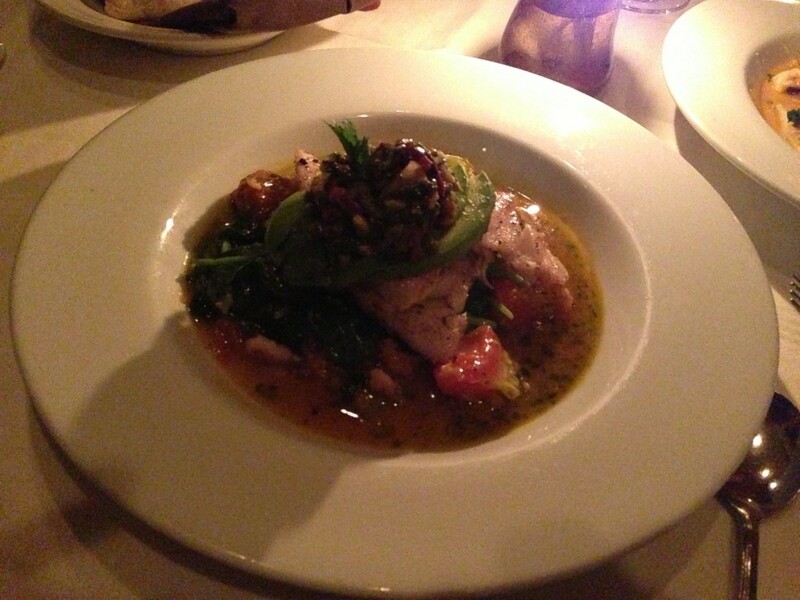 They source organic, locally farmed produce and all of their meats and seafood are sustainable. So impressed. I know we got a dessert, but after all the wine, I forget what it was 🙂 Thank you Window’s on the Water! On our last day, I had to find a good breakfast joint. 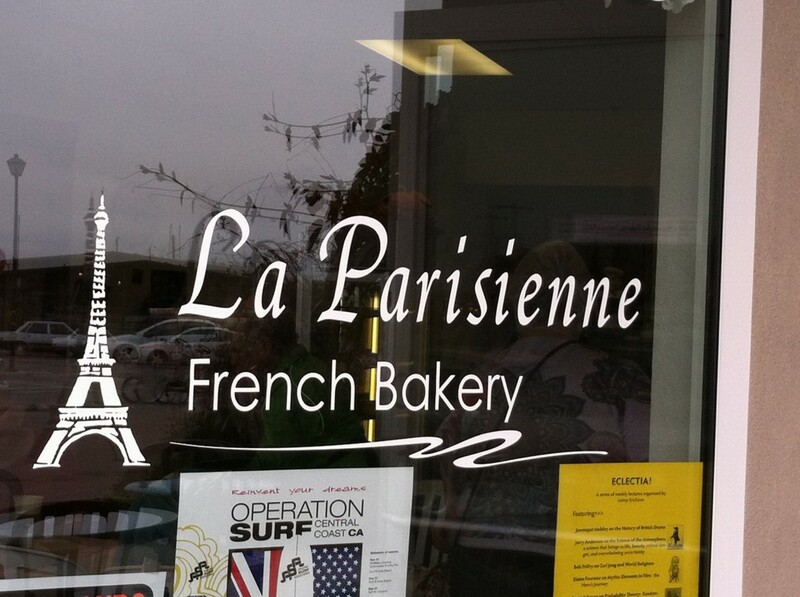 I read about a few places, but we ended up going to La Parisienne. It was a small café where you order at the counter. 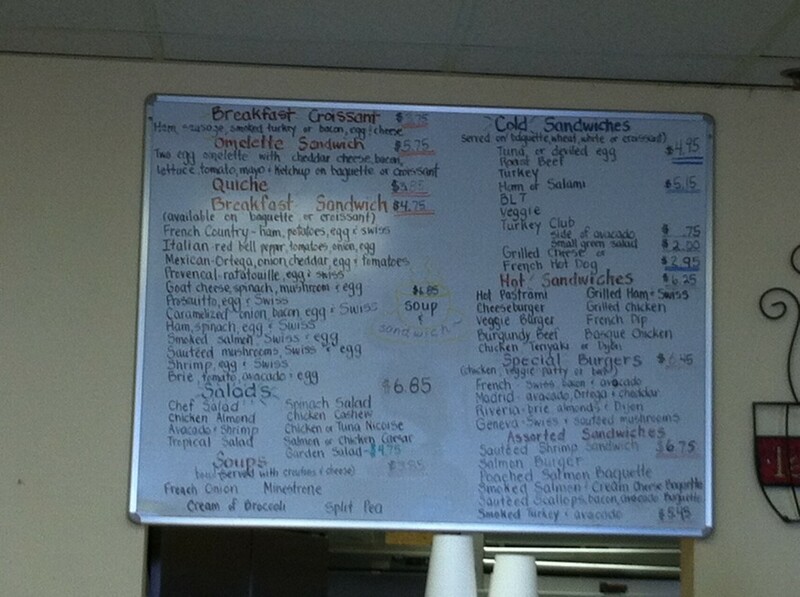 They had a SO many breakfast sandwiches on the menu, I thought I’d died and gone to heaven. We ended up ordering two sandwiches, even though I wanted them all. 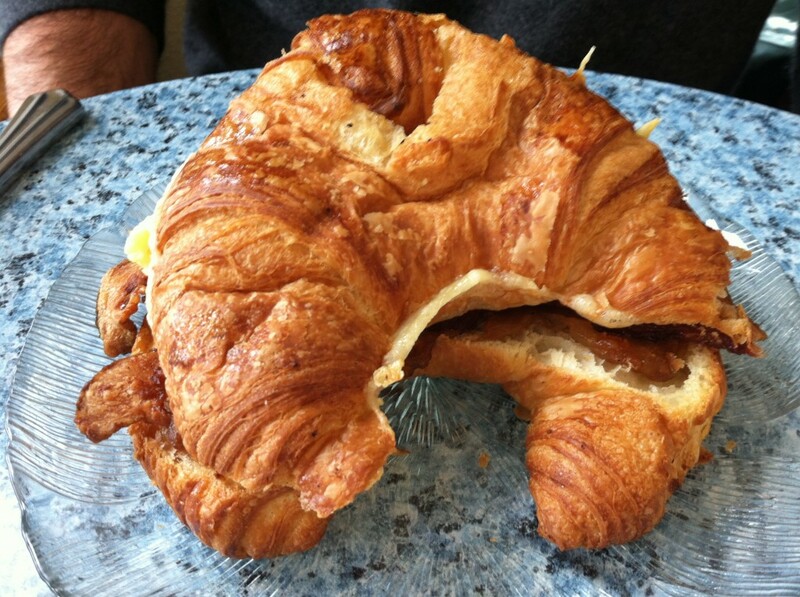 “Carmelized onion, bacon, egg and swiss” on a croissant: Loved the sweetness of the caramelized onions. 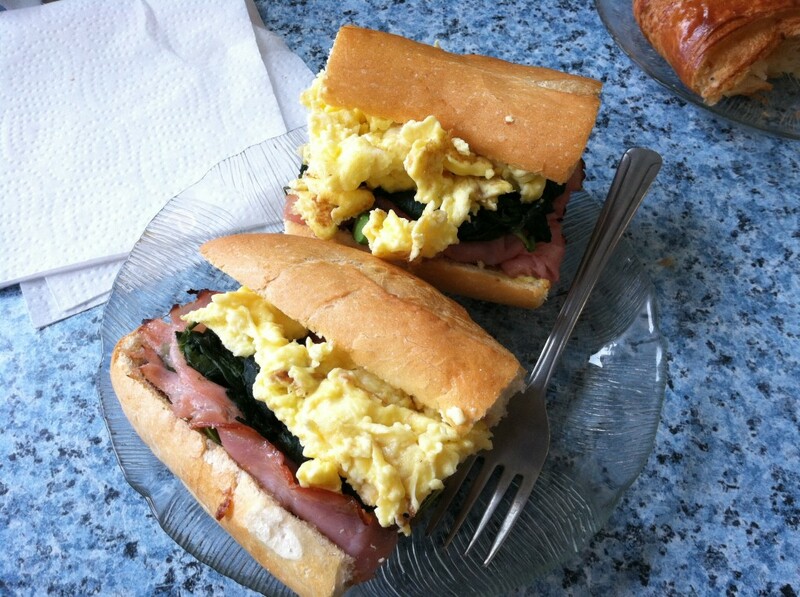 “Ham, egg, spinach, swiss” add avocado on a french baguette: I thought I’d like the croissant better, but I ended up liking this sandwich the best. That baguette was to die for! I of course put Tapatio all over both sandwiches. I can’t help myself! And most breakfast sandwiches in my opinion are too dry and need some sort of sauce or aioli. 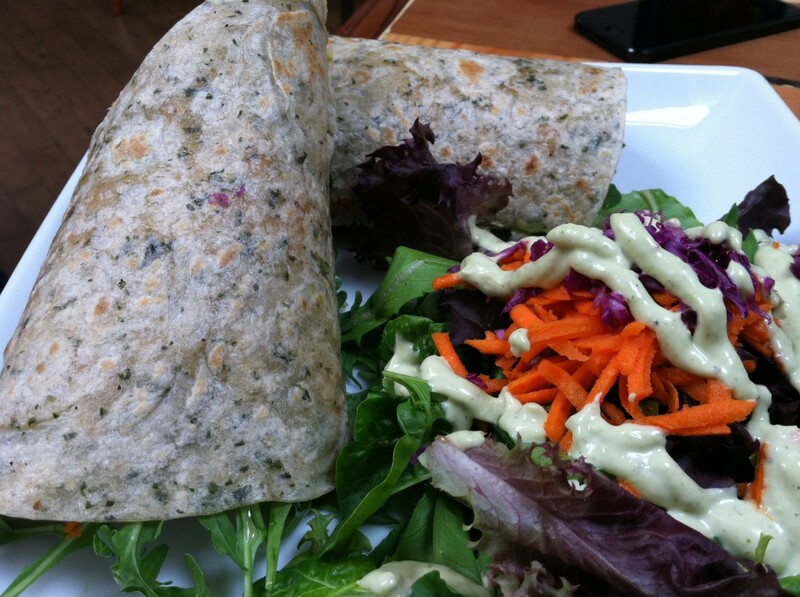 Last but not least, we stopped at Shine Cafe one more time to get food for the car ride back to L.A. We ordered a tempeh salad and the Shine Hummus Wrap. It was hard to leave the lovely little bay, but we will be back!